The Turbine Tube, also known as a downpipe, extracts the most power from turbocharged vehicle applications. Turbo efficiency, power and response is greatly improved. Each downpipe has an EGT Bung with cap for those who wish to monitor exhaust gas temperatures, without having to drill into their downpipe and void their warranty. Replaces pipe from turbo to the stock main catalyzer, which is kept. Best mated when used with any Tanabe catback exhaust system. 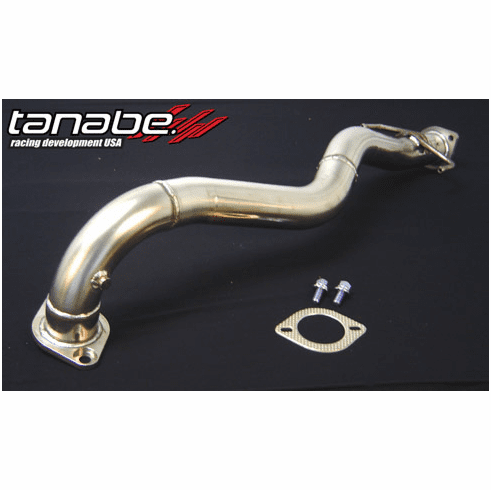 Also available, the ultra efficiency Y-PIPE for vehicles with the VQ35DE engine eliminates huge restrictions found on the factory Nissan/Infiniti exhaust system piping, and provides huge horsepower gains when used with Tanabe catback exhausts. The highest grade SUS304 stainless is used on all systems for maximum durability, as well as lightweightedness. Our experience in developing SUS304 systems has allowed us to reach a high level of craftsmanship in this field. The durable construction prevents and protects the downpipe from heat/stress related premature failure. All downpipes include an EGT bung located near the exhaust manifold, for accurate monitoring of exhaust gas temperatures. EGT bung is included so that the downpipe will not need to be drilled or modified for this important monitoring feature on turbocharged vehicles. On downpipes that have an O2 sensor, an O2 sensor bung is also included. This prevents check engine lights (CEL) and gas mileage problems associated when using an aftermarket downpipe that does not include O2 sensor bungs.